Dawn is a PC game that served as my capstone project at SMU Guildhall. The player takes on the role of Ash, a mysterious druid-like creature that uses magical wind powers to grow plant life and direct sunlight forward to open paths. The game features a distinct fantasy art style, and atmospheric storytelling techniques. 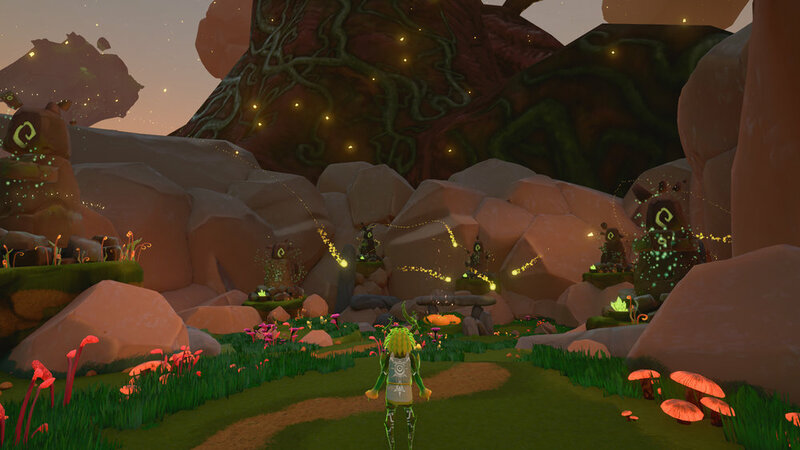 The player's overall goal is to revive he tree at the center of the world and restore balance to the world. Play Dawn for Free on Steam! What I Learned Working as a Game Designer to Become a Better Producer: I learned a lot about working with game designers by being one on my last project. Selected as a featured post by the editors of Gamasutra.com. Game Design Document Excerpt: This is a selection from the final version of our Game Design Document, where I documented key game systems prior to their implementation. Charity Livestream Preview Video: I appeared on a segment during a recent Extra Life charity live stream where I previewed Dawn alongside my producer, Andrew Curley, and discussed the development process. Throughout Dawn, the player travels through the world to revive a dead tree at the center. To revive the tree, the player must activate crystal "touchstones" that shoot concentrated sunlight out, connecting magical rings that open the path and guide the player forward. The touchstones serve as smaller objectives that the players see within given puzzle areas. When the player uses the interact ability to activate it, it flashes and reassembles the nearby rings, one after the other. The system also provided me with great opportunities to work with my level design team in the planning and execution of how the rings and sunlight complemented the player experince. Most importantly with this system, I worked with our Particle Designer Justin Peterson and our Unreal Sequencer specialist, Frank Xu, to choreograph the cinematic moments of each touchstone activation, and the ultimate revival of the tree at the end of the game. View of the base music cue in Wwise. When the player begins the game, all of the music tracks begin playing simultaneously, so that each of them stay in time with the others when made audible. The music in Dawn is light and whimsical, capturing the natural magic and wonder that I want the player to feel as they explore the environment. As the player navigates through the game, it also builds on itself in response to the player's progress to become thicker and more dramatic, before switching to a separate climactic track as the player reaches the final area of the game.